Miracles are supernatural to the natural, but natural to the supernatural. Miracles are restorative catalysts of Heaven’s influence solving Earth’s problems. Whatever Heaven is responsible for restoring is considered a miracle. A transformed life, a seemingly impossible situation turned around, an undeniable manifestation of supernatural intervention are classified as miracles. A life that experiences and facilitates miracles is tied to one who believes in miracles and walks under an open Heaven perspective, a Kingdom mindset. I am building a culture in my church where miracles are the expected norm. For the Christian who is really about the Father’s business, hearing the heartbeat of Heaven towards every situation in every moment is the motivation and hope of seeing the God of miracles breakthrough in Earth’s impossible situations. Miracles are greater works that point to the reality of the One who is greater. Miracles live on the edge of risk, promise and faith. That’s where they are found. We hope for the promise of God’s love to show up on our behalf, declare His promise to heal, save and deliver. Then take the risk of praying, laying hands on someone in need of healing, prophesying the magnificent intentions of Heaven into a person’s life and watch God do the miraculous. 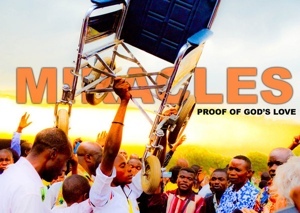 The DNA of miracles is the truth of the gospel…Jesus Is Lord. When the powers of darkness encounter the lordship of Jesus, every curse and stronghold are broken and forced to surrender to the matchless and supreme power of Jesus. The presence of Jesus is the breeding ground for miracles and breakthrough. The glory of God’s Son is the glory the born again believer carries on the inside of them. Most christians are more sin-conscious than they are glory conscious. Christ in you is the hope of glory, not sin in you. Christ died to set you free from sin so you can now live in the glory that you once fell short of. Miracles are a grace that abounds in the lives of those who believe they are free from sin. You have a right to claim a life of miracles. When one encounters the presence of daddy God and taps into the glory of Christ, they become a walking encounter, a production center for miracles to be released on Earth. Miracles make things on Earth as it is in Heaven. Jesus lived a life full of miracles. He lived with a Kingdom expectation and a life completely yielded to the leading of the Holy Spirit. The Holy Spirit reveals what Heaven wants to do through you. When you are filled and baptized with Him, you become a student of the Kingdom and are trained in the supernatural ways of the Son of God. As disciples were baptized by teachers in order to submit to their instructions, and as Jesus was baptized by John the baptist in order to fulfill the law, so are we to be baptized by the Spirit of God in order to become students of miracles. A life recklessly abandoned to the power of God’s Spirit will cause cataclysmic damage to the powers of hell on Earth. It’s the Holy Spirit that is the power from on High. He is the anointing that is responsible for all Heavenly activities invading Earth and the believer who partners with the Spirit of God will get results that others who fail to acknowledge doesn’t get. Miracles are tangible manifestations of supernatural things hoped for, the joy of answered prayers. No one prays unless they are in pursuit of something supernatural. When we receive our answer, we join in Heaven’s culture of joy and celebration. May miracles abound in and around your home, your family, your life, your ministry, your finances, your business, your education and your health. Remember miracles are your right to claim. Look for opportunities around you where miracles are waiting to take place. Heaven is heading your way! Expect a manifestation of the supernatural to daily take place in your life. Live with The Jesus Mind.